The high sec space should be the center of the whole game. Filled with life. Instead of that it's place where nobody chats on local just because some imbesil with iq of a three year old will do the only thing they can: press F1. There are no mining ops in highsec because the sad and useless game play that allows those worthless human garbage to ruin everything that others have built. That serves no purpose what so ever to the game. There are lowsec and nulsec for those who want to have limitless combat. There are duel and war declaration for combat in highsec. Why that is not enough? This game is clearly for those who hate. I wonder how sad human waste they are in the real life. So then, why are you playing? True wisdom comes not from identifying a problem, but by what one plans to do about that problem. The majority of players are in high sec. So it's hardly empty. People don't chat in local because either it's too busy, or because people are just passing through. Good local chats are had between people who occupy the same space and actively engage with each other... often by pressing f1 to say hello. Yes, there is low and null and wardecs... and ganking. It's been part of the game since day 1. Why are you trying to take away an Avenue of interaction? Eve players, on the whole, are among the friendliest and most helpful player base of any game out there. Yes they will blow you up in a hot second if they get the chance. But it's just a game, and explosions are part of that game. There is rarely any actual hate involved. And frankly, if you are getting upset over some space pixels getting blown up, when that's kinda the point of the game. Then I would sincerely suggest re-examining your priorities. It's been that way since 2003. Even if Eve does die, it outlived most of MMORPG, Ultima Online, Asheron’s Call, and EQ would be the only big ones that are older. Therefore, I believe CCP did something right. Human nature is, by default, dark. Just look at kids building a sand castle on beach. There are those who build and there are those who want to destroy it. Actually, what you said is utterly wrong. The majority of people are relatively decent. Sure, there are countries where dark forces (example, the Koch's) have twisted the narrative over many years, and driven people in the direction of maliciousness. Human nature is that of tribalism, which in and of itself is not "dark". Now, when it comes to Eve, yes, there is a larger than usual percentage of the player base that are sociopaths. CCP designed the game for those sociopaths, and has catered to the sick wants of that segment for years. Who can forget the marketing campaign "Be the villain."? But overall, still, the bulk of the player base are decent and good people. Unfortunately, it only takes a small percentage to destroy the work of the majority. And CCP has gone out of their way to strengthen the position of the evil ones. If it tanks it's because ccp isn't doing worthwhile expansions and is wasting all their time recoloring the same stupid shirt a dozen times and putting out broken patches every few days while manipulating the markets to drive up revenue they lost in failed projects like world of darkness before they sell the game to $ea$. Uh Oh... looks like someone lost their Retreiver. There is a trend that happens when things go to Free to Play. I don't think it's fair to call all highsec miners imbeciles with the IQ of three-year olds. There are a few that manage more than pressing F1 to mine their rocks and actually pay attention to local and even respond to you when you reach out. It's true though, many seem to be unable to do anything other than warp to a belt in a fail-fit barge or exhumer and press F1, but that is probably more of an impression because they are watching Netflix or playing Rocket League than they are actual retards. I too wish for a better quality of highsec miners, but unlike you I take active steps to improve their caliber through interaction with them rather than just calling them names on the forums. Sounds like you lost a ship and got really scared. There is life where you want to find it. The center of the whole game is to make what you want out of it. Quit complaining. Either leave EVE behind or HTFU and fight back. Why do I live in low sec? Because I am not meat for some ganker to fly catalysts up to and destroy. Do I hate high sec no not at all I just think it is easily the highest risk space in the game so why would I possibly go there? I dont think anyone hates high sec. Ho ho! Is funny, because he was actually not talking about hi-sec miners at all, and you flipped it around! Pardon? I've been having fun for almost three years with my friends IN HIGHSEC! Highsec is the center of the game, it constantly has the highest player densities. Heck last month the Forge had the most destruction, Production, and trade value. Heck the Forge competes with most null regions for mining value, which is freaking bonkers to me as highsec ore is well awful, to say there are no mining ops, well blatantly false. 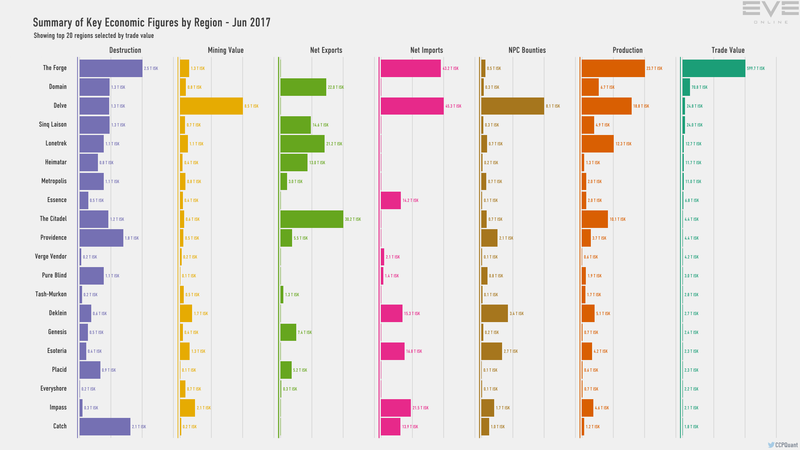 http://cdn1.eveonline.com/community/MER/Jun_2017/1_regional.stats.png Sure stuff flares up in null and makes headlines every now and then, but High is where most of the action happens. sure there may not be many highsec mining ops, but that makes a lot of sense. Mining is a rather passive activity that I assume most people do while they are trying to watch tv or something like that. Also adding an extra member isn't really a benefit as there isn't an easy way to coordinate payouts, not to mention a lack of trust of those payouts even happening. Also more people means the belts get mined out faster meaning they have to either move or stop. That said In high sec there are robust incursion communities which shows the community can work together and be somewhat trustworthy. and sure they may be some f1 "imbesil" but hey, you are the one that got caught by them. Lets just say that doesn't look good on you. Just came back, and it looks like EVE is actually picking up players. Majority will play in high sec makes sense since most of the content is accessible there/ You pay a price though, and that is a much lower ISK per hour. The money is in null, and it's believe it or not in a way safer than high sec. If you find yourself regularly getting ganked you're the problem. One you're too stupid to find a new system to mine in. Two you're mining AFK. Three you're too stupid to pay attention to how the aggression mechanics work. And finally you don't pay attention to local. EVE 101 PAY ******* ATTENTION TO LOCAL! It doesn't matter if it's high sec you pay attention to local. I try to be nice and mind my business just shooting lasers at rocks. There is just way too many asshats in New Eden for that to happen. Eve could be better, I'm not a PvPer, but the night sky is where my heart is. The high sec space should be the center of the whole game. Filled with life. .
Trust me, it is. Every time I wander into high sec, I am amazed by the huge numbers of living folks doing..... whatever they do in high sec. Buy moon goo to take to nul sec? High sec is incredibly peaceful and safe. It is simply not viable to go hunt folks there and make a decent living as a hard working pirate. Concorde are fascists. I say that as a total citizen. I have dank sec status and fought in the militia. Etc. This game is clearly for those who hate. It is clearly for those with a capacity to focus their hatred from time to time. There is no such thing as a person who can't hate from time to time. Even the most feeble snowflake hates what he hates. The question for men of purpose and focus, is whether they can apply their hate through artillery and onto their sworn enemy. When hate destroys a caldari ECM boat, hate is good. This game may or may not be for those who hate, but it is NOT for those who quit. Will you wander off to play another game, infected by the hate you witnessed here, or will you finish what you've started? You started your character in high-sec; high-sec is a NEWBIE ZONE. All of it. The asteroids are newbie-grade, the combat rules are "protect the newbies", etc. Your fault for staying in high-sec; there are no opportunities there. EVE is a PVP game. We play it to PVP vs. other players. War declarations and suicide-ganks are valid game play. Try your "i want to mine in peace" post in the Overwatch forums or on the forums for any other PVP game, see how smart the replies make you feel. The game is about building sandcastles. And it is about kicking sandcastles. So every now and then, while you're building one sandcastle, another one of your sandcastles is going to get kicked by someone. Get used to it. All you have to do is make sure, you've got more than one running at a time and that you kick other sandcastles every now and then. Helps to keep a healthy balance in game experience.